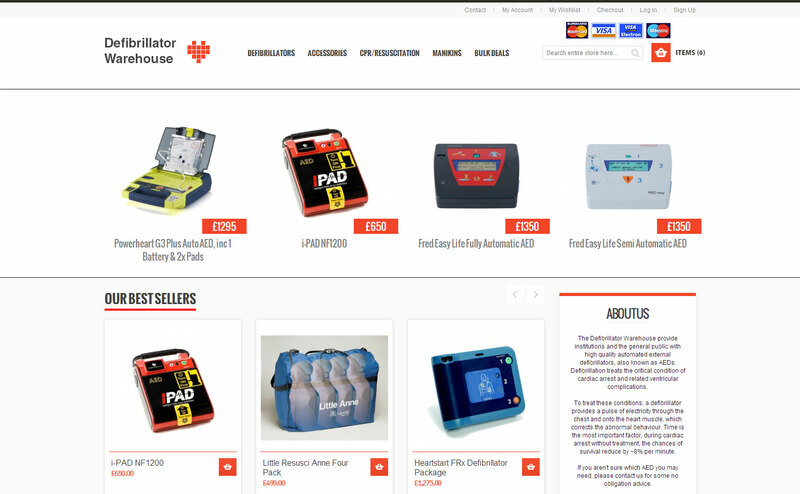 Brief: After having a web-store for 3 years and selling nothing on-line, Defibrillator Warehouse approached me for some consultation. After explaining the issues with their current solution, I was tasked with designing, building, and marketing a new site. Solution: A Magento e-commerce store for great usability and good SEO, an instant chat facility to increase customer feedback and communication, Google AdWords PPC/PLA campaigns and email marketing to promote the new store. All leading to 3,598 new visitors and over £20,000 in sales within 60 days. Project highlight: Helping drive revenue from £0 to £10,000/month. Brief: I was commissioned by a local IT company to design and develop a cross-platform app for their clients Exceed UK. Exceed train Hewlett Packard's American and European sales-teams, and the app needed to help them achieve greater efficiencies. 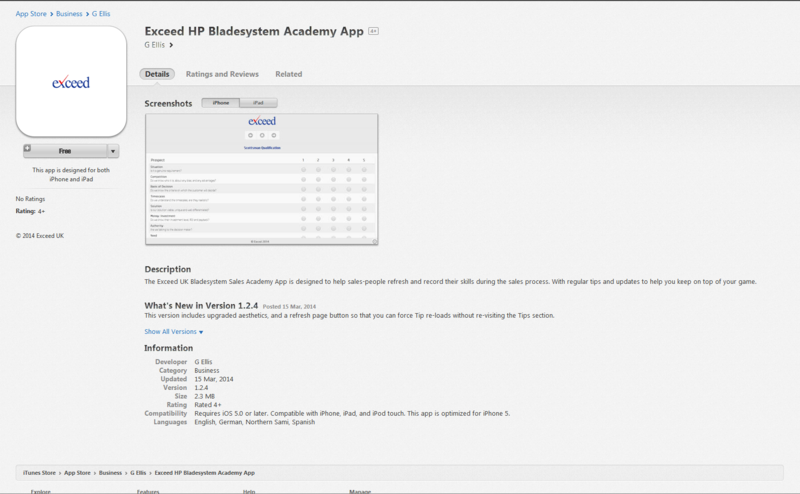 Solution: The app went through several revisions, allowing Exceed UK and Hewlett Packard to tailor it to their needs. The final product had several major functions: Trackable video training section, a meeting planner, an updateable tips section, and cloud printing. Project highlight: Enabling Exceed to regularly add content to the App themselves. Brief: I was hired again by the visionary DUO to build a pixel-perfect version of their awesome design for a London-based social engagement agency. Solution: The site utilises a lot of the latest web-standards, using poly-fills to make up for lack of support in older browsers, giving all visitors a great experience. 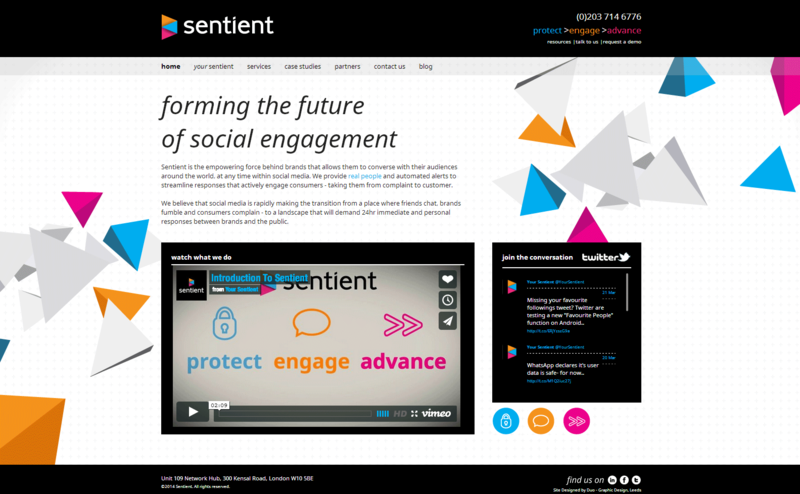 Project highlight: Helping Sentient deliver their message in engaging ways. Brief: A graphic design company asked me to help them deliver a website for Leeds Metropolitan University who are developing a new range of short courses and want an easy way to deliver them to the public. Solution: The site allows Leeds Met to list new courses as they are developed along with availability, tutor information, and links to the main on-line booking section. 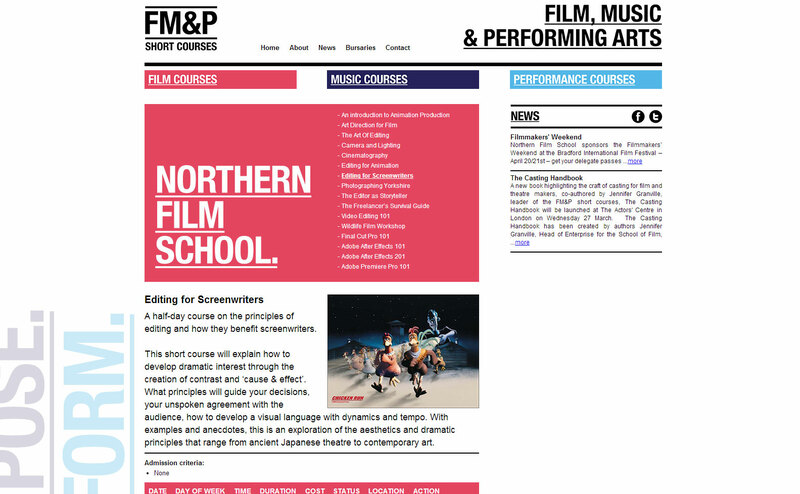 Project highlight: Creating an easy-to-use editable site for tutors to post courses on. 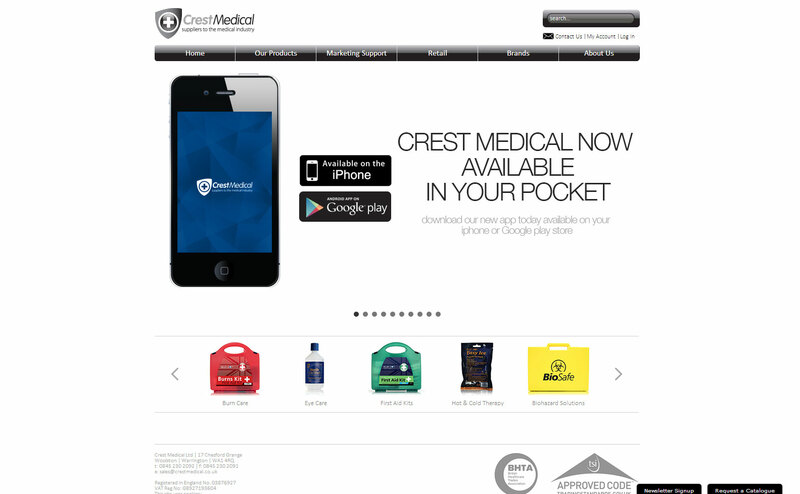 Brief: Crest Medical wanted to promote their new catalogue in as many ways as possible, and give the off-site agents an easy way to get product information for customers when on the road. Solution: By using the existing website's catalogue, and Magento's in-build REST application programming interface, I was able to create both an Android and iPhone app in just several days. The app is a rapid way of navigating through the products whilst not at a computer. Project highlight: Utilising existing services to reduce time and cost for the client. Brief: I was asked what the options were for developing a website similar to Monster.com or Reed.co.uk for a new recruitment consultant company. The site needed to be easily editable, enable the owners to list vacancies and receive CV's, as well as allowing users to search the job database and apply on-line. Solution: I created 3 proposals of varying specifications for Eden Lea to choose from, and created wire-frames for the designers to use enabling us to deliver the project efficiently, giving Eden Lea a feature packed site for a lot less than they expected. 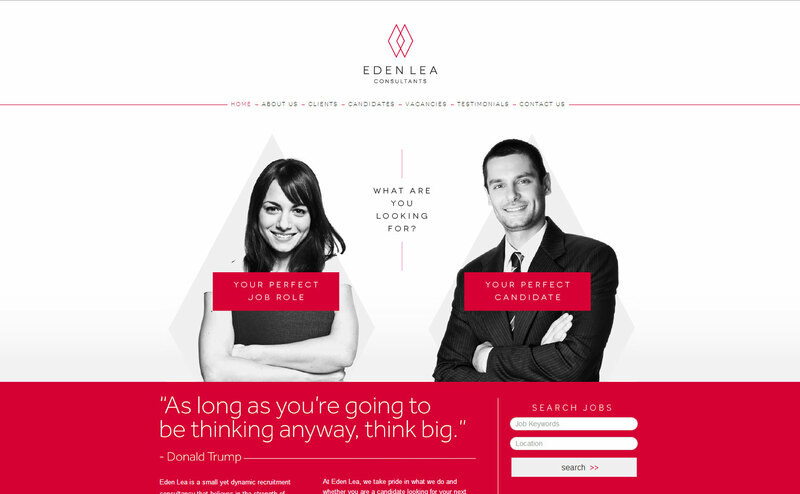 Project highlight: Providing a system which really helps Eden Lea's core business. Brief: After using me for their core business site, Crest wanted to re-vamp their logistics division, with a fresh modern website and some modern media elements. Its primary focus was to attract new clients so it needed to rank well for 'third party logistics', a very competitive term. Solution: I delivered a responsive, metro-style website, animated introduction video, two service explanation videos, and an order-tracking section to allow customers to track UK Mail parcels through the website. The SEO & PPC campaigns attracted several new clients, and consistantly ranked in the top 3 Gooogle results during the campaign. 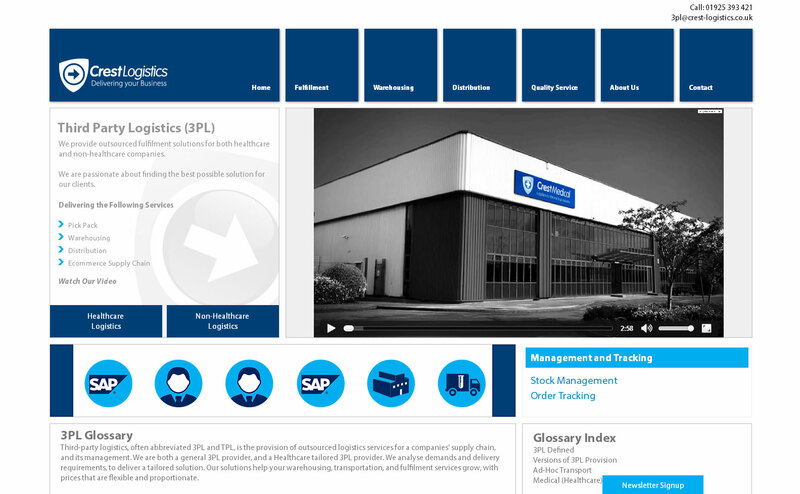 Project highlight: Delivering the whole range of services on-time and under-budget. Brief: I was asked by a graphic design agency to help them develop a cutting-edge one-page scrolling website for a subsidiary of Oilon the worlds largest oil burner company. 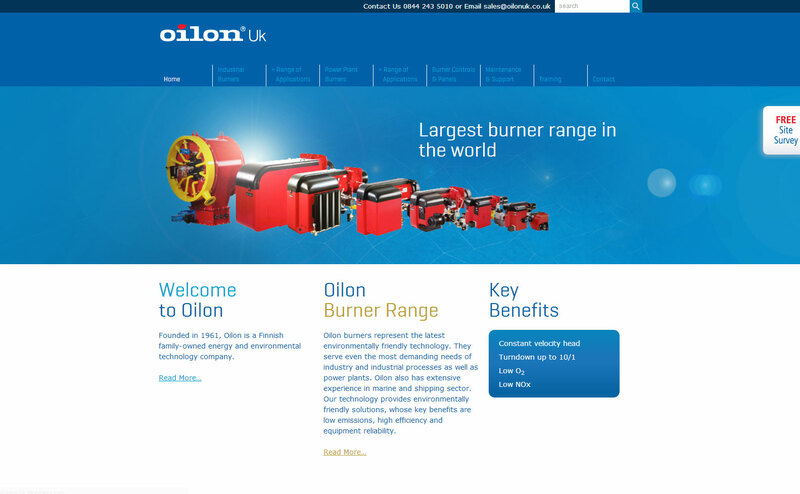 The site needed to inform concisely on the product the customer is looking for, and rank as highly as possible as quickly as possible for the new brand term 'Oilon UK'. Solution: Working closely with the designers, we developed a site which contains a vast amount of information contained in only several short sections, using tabular displays and pop-up boxes to display more detailed information only when relevant. A lot of effort was put into optimising the site's content so that it could rank well on Google for its brand term with minimal extra SEO. Project highlight: Helping the worlds largest burner company enter the UK market. 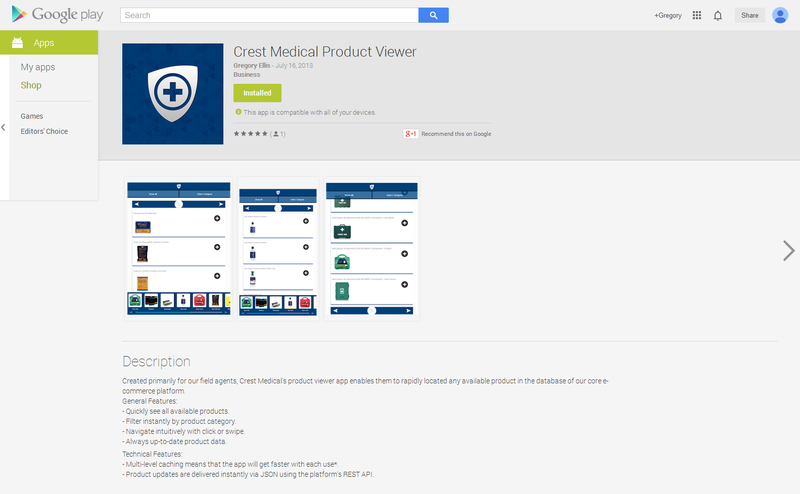 Brief: Crest Medical needed a comprehensive on-line retail solution for their members only trade website, and were considering Magento Enterprise which costs $16,000 per year for licensing and support. Before taking the plunge they contacted me for some consultation. Solution: After explaining the pros and cons of Magento Enterprise vs the free Magento Community edition, Crest decided to use me to deliver their new solution and provide the on-going hosting and support services. The new site reduced bounce-rates, increased returning customers, and ranks higher in search results. By utilising a custom server set-up, and core-code modifications, we achieved all the tech benefits of the Enterprise version. Project highlight: Giving Crest their world-class super-fast store for much less. Brief: I worked together with 'Designed by Duo' to deliver their vision for a fresh & funky one-page scrolling site to advertise a new data capture company's services, in a concise manner, with a low budget and very tight schedule. Solution: Some hard-core coding produces some beautiful random data generation displayed as colourful hexagons on the landing page, the user can hover over these to organise them into a meaningful pattern, which is a metaphor for Captus' service. The landing-page then clicks through to a vibrant main site. Project highlight: Achieving < 10% bounce-rate due to such an engaging landing page. Brief: A design agency in Leeds asked me to help deliver their design for a restaurant which was re-branding and re-launching itself. The owners were keen to get on the social media wagon and wanted their facebook and twitter feeds updating on the site, as well as a blog which they could use to post news and offers. Solution: We chose to build the design onto the WordPress content-management-system, giving Leeds Seventeen the easiest way to update and add new content. 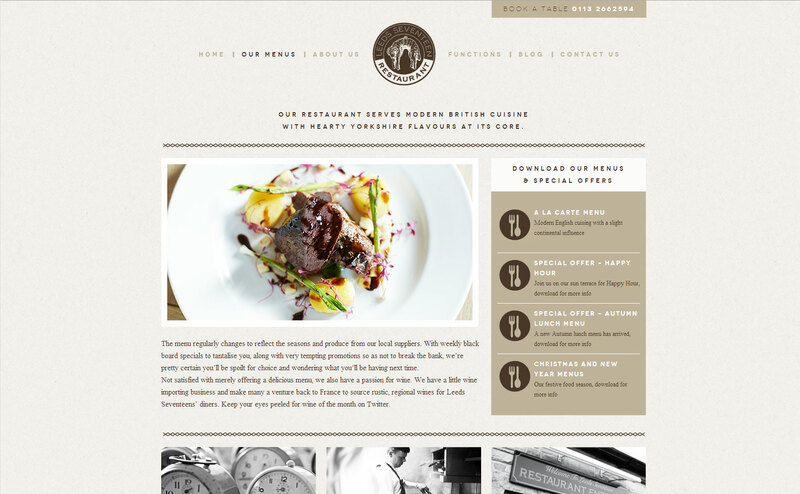 Customers can also view and download menus on-line, which the owners can update whenever they want. Project highlight: Reflecting Leeds 17's great re-brand online. Brief: A graphic design agency hired me to build this gorgeous brochure website they had designed for a London based high-end refurbishment company, to help them showcase their work. Solution: A clean, sharp site which uses quality photography and some slick scrolling galleries to emphasise the high-end nature of Valde's refurbishments. 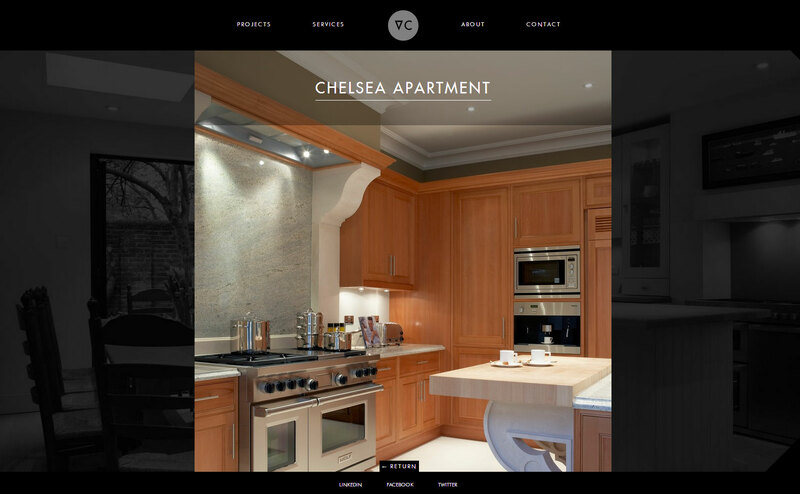 Project highlight: A simple brochure site that's already helped VC gain new clients. Brief: MBI were struggling to advertise and recruit high quality staff fast enough for their new day centre. They wanted the on-line solution to kill two birds with one stone, but were concerned about on-going costs. Solution: A modern responsive website which helps advertise new services and delivers a professional image. The site also allows job-seekers to go through the recruitment process on-line, saving a lot of time and reducing paper-work. The content-management-system (CMS) allows them to update the website, removing future admin costs. 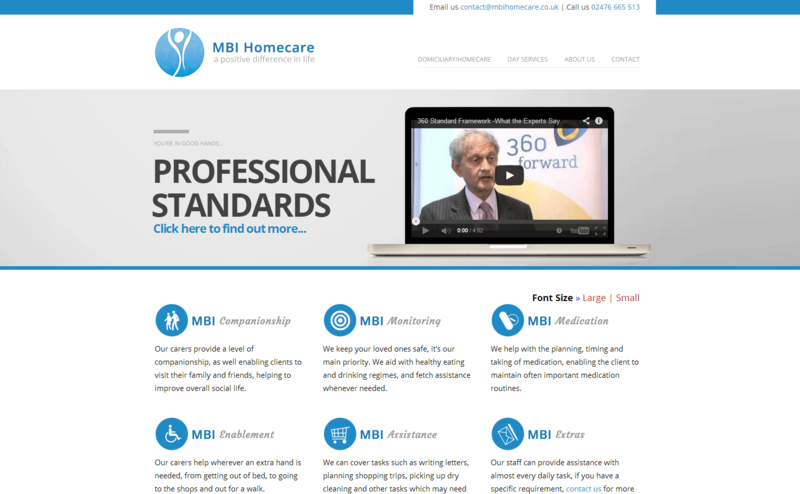 Project highlight: MBI receiving dozens of applications via the site within days of launch.